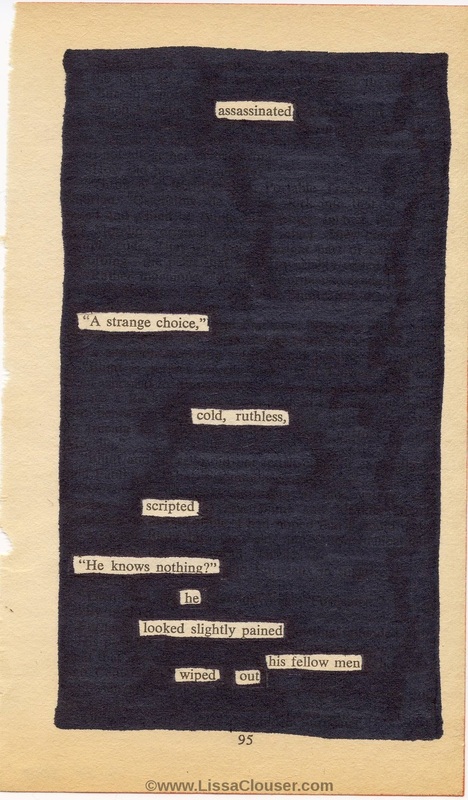 I love the idea of black out poetry. I’ve never actually tried it myself but now I really want to! This is really interesting. I might try this out soon! Thanks for the inspiration. I read your “About Me” page, and I too, do not have any kind of degree in writing. I work in Real Estate (Agent Services, not as an agent) I know… BORING. I work part-time though and it allows me to spend more time writing! I am also a mom, and almost a wife. Only 16 days left until my wedding! Anyways, I am commenting on your blog because yours is the first one I’ve read on WordPress that draws me in. You seem like an interesting and lovely connection to have. Thanks for having an honest heart for poetry! You don’t have to “make it” in the profession because I can see that you already have. I’d like to read more of your poetry, and I know you don’t post a lot of it on your blog, but let me know if there is another way I can connect to view your poems. The holidays ended up being a crazy mess (in both good and rough ways) and so I haven’t been posting on here as much as I would like. Hopefully I’ll have more blackout poetry to post soon at least. Who knows, other poetry might show up on here too! Congratulations on your wedding being so near! I hope your day is an incredible one filled with joy that overflows from you and makes you sparkle like a Disney princess (or whatever sparkly creature you most wish to embody that day!) And once again, thank you. Your words have really uplifted me today and inspired me. Thank you for your kind words, as well.